Smoothies are an easy way to cram more veggies into your day. A little fruit covers up the healthy taste and if the green color bothers you, just avert your eyes. This has become my go-to recipe, but you can make some tweaks if it’s not sweet enough for you. Add a tablespoon of maple syrup or use a whole peach/banana instead of half. We don’t have a fancy blender…although I really really really want one, I can’t justify the crazy price. There’s an easy technique for making a good smoothie with a normal blender. Check out this video from Good Eats – the technique info starts at about 4:22. My blender has four speeds. I run it on the first until the vortex starts, then each higher speed for one minute. If a bubble forms, I turn off the blender, give it a little shake to encourage the “burp”, then turn the speed back up. It takes about 4 minutes of blending, but that’s enough time to put away the ingredients and make a cup of tea. If you want to get crazy, add half an avocado to the mix. We ordered a box of them from California Avocados Direct, a responsible family farm, and were blown away. 1 Tbsp Chia seeds or ground flax seeds Chia seeds will make it thicker; flax seeds will give it a nutty taste. 1/2 tsp Ground cinnamon Other spices, like cardamom, are nice, too. If you are organized and want to be like Alton Brown, prep your smoothie the night before. 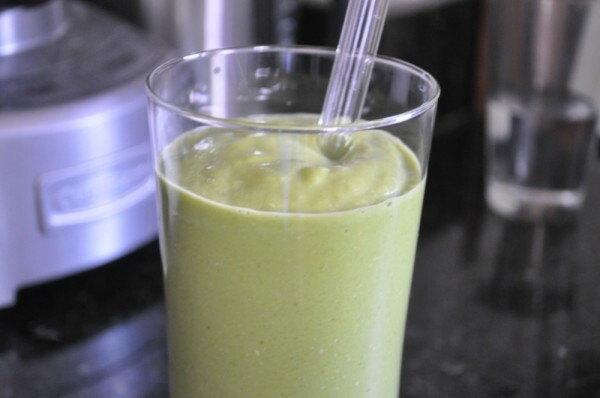 Put everything except the ice cubes into the blender (in order) and stash it in the fridge. In the morning, add the ice and blend, following the directions above. Make sure all the spinach/kale blends in. Sometimes a leaf or two will stick to the side. This is a great way to have a nice smoothie even on a busy morning. If you, like me, are usually not that with it at bedtime, make your smoothie when you’re ready to eat it. Add all the ingredients to the blender (in order) and blend, following the directions above. It might take a little longer for the vortex to form, because the fruit is still frozen, but you can get it going by stopping the blender and smushing the spinach/kale down toward the blades. When you start up the blender again, the smoothie should start moving. It might take a couple of tries. If it’s really giving you trouble, add a little more water/juice/milk. It’ll thin out your smoothie, but usually does the trick.